I promised him (and everyone else on that thread) that I would share more — not just because of the original post, but because of the ensuing dialogue with others that followed. Actually, I have wanted to do this for a long time, but again — calculated risk. As someone who has been going to churches for over 27 years, and leading in churches for 19 years, very public statements about church can cause a myriad of responses. My intention is not primarily to provoke responses. That will happen as the natural result of people interacting with my ideas. My primary goal here is to share what’s in my head and heart. Since I’m doing it here on the ThinkTheology blog, there is an open invitation to join the dialogue and to push back. That’s the nature of thinking theologically, biblically, and practically about things in the trenches of life and ministry. I do want to talk about it (dialogically), but I also want to talk about it (monologically). Thanks to the magic of a blog with an open comment thread, both can be accomplished here. This will be a multi-part series that follows a rough outline of (1) my own journey into church, (2) a full break-down of my own working dynamic definition of church, and (3) my responses to several questions that friends, family, fellow church members, and other pastors have asked me about church since I left full-time vocational ministry last year. There may be more, but that’s my outline at this point. Thus, the next post will begin with the most healthy way to begin anything worth talking about — with a story. We all have a story about church. So, the second post — coming soon – will be my own attempt to sketch out my own story in big pieces as a backdrop for how I am working through the practical and theological issues related to church. 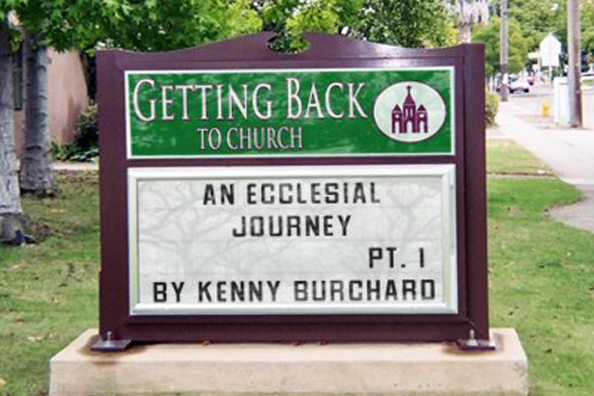 The series here is titled, “Back to Church – An Ecclesial Journey.” The title is very intentional and has multiple layers of meaning. First, it is way of saying (in contrast to what my friend felt) that I actually don’t want to discourage anyone from going to church. But I do want to (and will) share my own caveats about how I would personally use that phrase in light of both emerging and well-developed convictions about church. Second, it is a way of talking about my own intentionality in reforming my own theological/ecclesiological convictions — not by getting new-and-improved ones, but by going back to the biblical idea of church as it emerges across the time-line of the Biblical narrative. This has caused me to make big and small decisions about church that have reshaped, and will continue to radically re-shape my relationship to churches in the recent past and in the future. Third, it is my way of telling myself and everyone else what I want to do practically. I don’t want to be (and have never been) a side-line spectator, analyst, or critic of the church. I have been a participant, practitioner, founder, pastor, leader, and champion of the church. If I have much criticism about things (and I do have some), I hope it will tend be directed primarily at me (and the way I have seen and done things), and secondarily toward others. And I hope that it is constructive (intended to re-shape and build up what is good) rather than destructive (intended to harm and tear down what is good). Take it personally if you think it would be healthy to do so. I will also make a commitment not to criticize the church of Jesus Christ, or to attack her. To do so would be (1) Anti-Christ since Jesus loves the church and gave himself up for her (cf. Eph. 5:25), and (2) it would likely not bode well for me in my own relationship with Jesus to attack his bride. I know what rises up in me when people attack or criticize my wife, and the church is the Bride of Christ (cf. Rev. 21:9). If you feel I wander off the path and start attacking the Church of Jesus Christ (rather than the things that attach themselves to church and become conflated with church), then by all means, push back! That being said, I will try to be both loving, but truthfully unsparing in my criticism of the things that have infected the word church, the idea of church, and the ultimate of expression of church — which are not actually church at all. In my own life, I want church. I want to be church, and be with church. In reality, when we come into relationship with Jesus, we are church. I never want that to change, and that never will change. I will never (and do not now) think of myself as a churchless christian. But I do want to basically get rid of everything that is not church, and that will be both terribly painful and/or incredibly freeing on different levels for different people. A final word about deconstruction. High five, and amen to that! However, I have done a huge amount of deconstruction of my own ecclesiology and the related practices over the last couple of years — and especially over the past several months. But I have done it as someone who has spent almost two decades building, and nearly three decades being involved, working, helping, attending, and partnering! In fact, I planted a church, pastored it for twelve years, left it in great shape with a couple hundred people who loved each other and who wanted to follow Jesus together, a great team of elders and an amazing staff, every piece of equipment needed to do the stuff we were doing (bought and paid for by that church family over my years with them), and hundreds of thousands of dollars in the bank, and (if I may say so) a legacy of fruitfulness seen in the lives of the people who received Jesus, were baptized, and who moved closer to Jesus and His people as a result of what we were doing together, and what He was doing in and through us. In other words, I have been a builder. I don’t approach this subject as a side-line deconstructionist who has never built a thing, nor as someone who is angry, bitter, and critical that everyone doesn’t see things my way. I pastored (or tried to pastor) people like that, and they were the biggest pains in the a… – er – neck… that a pastor has to deal with. Rather, I approach the subject as someone who has been a part of various churches from 30 members to a thousand members over the course of nearly three decades. I have been a volunteer, a youth leader, a Sunday school teacher, a young adult leader, a worship leader, an associate pastor, a senior pastor, and a church planter. If we’re talking about how to “do” church in North America, I get it. Been there, done that, got a drawer full of T-Shirts. All of this, in addition to my own journey through the scriptures as a Jesus-follower, a teaching pastor, and as a seminary-trained New Testament biblical scholar gives me a bit of information to interact with as I sort through my own convictions and share them here. It is all of those things that I hope will inform what flows out in the posts that follow. So. Stay tuned. The next post (update: here it is) will be a summary of my own journey with church from the Summer of 1987 thru the winter of 2013. In the meantime, now that you’ve read my monologue, let’s dialogue below primarily with the ideas I’ve outlined here, or feel free to add your own questions, feedback, perspective, or concerns below. I like it, Kenny. I think this more in-depth explanation of your recent FB post is necessary to clear the air and hopefully shed more light on how Jesus intended the church to function. Looking forward to part 2! Kenny, I am looking forward to the dialog. I hope to expand and refresh my own thinking and my dialog with students when we discuss “ecclesiology” in class. Joel – I appreciate you and your honest questions, as well as your personal commitment to keep growing in your own pursuit of Jesus, and your own relationship to his Church. Part 2 is coming. Thanks James. BTW – I owe you (1) a coup of coffee, (2) three lawn chairs, and (3) some hang-out time with you and your wife. Looking forward to going deeper in life, friendship, and ministry here in VA. How much time do you spend on the subject of ecclesiology with the students? What books are they reading? Kendo Master-san. OH HI O GO FOR IT. I look forward to reading this for I am in a mire of loyalties like you have mentioned. Having been a part of a start-up with a great young pastor, I became enraged to discover after my family moved away that that then leadership caused the death of that start-up. I know we all have what it takes to de-commercialize American church. The youth are aching for it. Finally got around to reading this one (Thank goodness for Safari’s Reading List). Thanks Kenny! Great stuff. Looking forward to reading Part 2 (I’ll get to it soon) and beyond. Thanks for sharing your journey.